Pedestrian Accidents | Eduardo De La Cruz-Munoz P.A. According to the National Highway Traffic Safety Administration, pedestrians, on average, are injured every 8 minutes and killed every 2 hours in traffic accidents in the United States. Since they are more likely to walk or use public transportation, those living in sprawling urban areas are particularly vulnerable to pedestrian accidents. 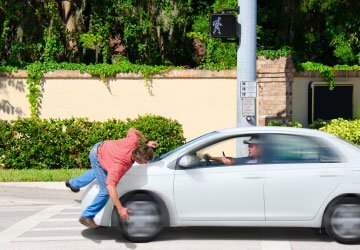 Negligent or distracted drivers, as well as insufficient traffic signals and lack of designated sidewalks, among other factors, all contribute to the risk of pedestrian accidents and injuries. Thus, drivers, but also and pedestrians, are equally responsible for remaining alert and vigilant in order to avoid an accident. Due to the lack of physical protection, pedestrian accidents often result in serious injuries and sometimes death. Injuries resulting from pedestrian accidents may include broken bones, loss of limbs, internal injuries, or damage to the brain and spinal cord. Some of these injuries may require long-term treatment and rehabilitation, which can be exceedingly expensive. If you or your loved one has been a victim of a pedestrian accident, you deserve a competent attorney who will explore every possibility to ensure you receive a just compensation for your pain, suffering, and medical bills.